I just recently released Cyphesis 0.6.1. The official announcement is over at the Worldforge site. This is the first release after I took over from Alistair as maintainer. The focus, as well as with the upcoming Ember release, is fully on implementing features to make it easier for world authors. This follows the strategy I laid out when taking over maintenance duties in April. In order for Worldforge to attract new developers and world builders we must make it much, much easier to actually create worlds. A crucial part of this is making sure that any changes done on the server actually are persisted between server restarts. Previously this wasn't true, as no "minds" were persisted. That meant that all of the behaviour and knowledge of any creature or character was wiped out when the server shut down. That of course made it quite hard to iteratively construct an interesting world. Not so anymore! But not only that; it's now also much easier to both alter and inspect minds. This was also a source of frustration previously, as there was no good way as a world author to interact with the minds. While a crude mechanism for inserting new goals was available, this didn't really cut it. Especially when goals malfunctioned or behaved in non-intuitive ways. Trying to figure out why the woodcutter wouldn't cut down the tree one meter in front of him was nigh impossible. All of this is now improved as it's now possible to add, delete, alter and inspect goals. 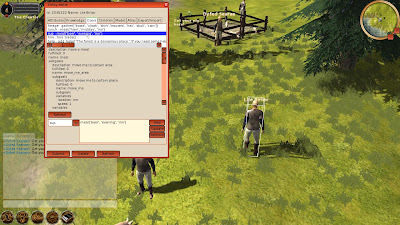 The latter feature is a god send when constructing behaviour or implementing new goals, since it's now easy to see exactly what a certain NPC is thinking. However, in order to fully use these editing feature you must run the latest version of Ember. There will be a 0.7.1 release shortly; we're currently working out some final issues. In the meantime, if you want to try these new features out you should run Ember from the Git master branch, preferably through the Hammer script. Can I make a suggestion? Maybe a thread in freegamedev.net forums with updates (like another projects already are doing) could attract somebody. It's never bad with more visibility. I'm spread pretty thin currently though so it's hard for me to get time for it. But I'll definitely check out the forums. They seem to have grown since I last looked.